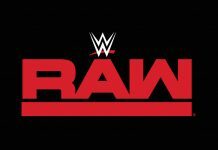 – Tonight’s WWE RAW kicks off with the usual opening RAW video. We’re live from the Resch Center in Green Bay, Wisconsin as Michael Cole welcomes us to a sold out RAW. – We go to the ring where Nexus makes their way out. One-half of the WWE Tag Team Champions John Cena is dragging behind everyone else, taking his time getting to the ring. David Otunga proudly displays his title belt. Wade Barrett stops and stares at Cena, who distances himself from the rest of the group in the ring. The crowd starts chanting for Cena as Barrett prepares to speak. Barrett tells everyone to simmer down as he would like to introduce the most dominant group in WWE’s history – The Nexus. Barrett introduces Otunga, Heath Slater, Justin Gabriel and points to Cena, telling him to get in line with the group. Barrett introduces Cena next. Cena tells Barrett he can’t see him, right in his face. Barrett says they did the unthinkable last night, talking about the burial of The Undertaker. Barrett says it’s none of our business why they helped Kane. Barrett says they had their own reasons for helping Kane. Barrett says later, he beat Randy Orton. Barrett tells Cena to explain to the fans what happened. Cena says Barrett was about to get beat down by Orton. Cena says he interfered, got Orton disqualified and Barrett won the match. Cena congratulates Barrett. Barrett says he was about to become the new WWE Champion when Cena interfered and put his hands on him. Barrett talks about Cena handing Orton the WWE Title next and getting laid out by an RKO. Cena explains that Barrett said he would fire him if he didn’t win the match. Barrett won the match, so he’s not fired. The e-mail alert goes off and Cole steps up to the podium. It’s announced that Barrett is entitled a WWE Title shot since he technically won last night but the match needs a special referee. It will be Randy Orton vs. any member of Nexus tonight. The winner gets to choose the special referee. Barrett sizes up Nexus and picks Cena as Orton’s opponent for tonight. Otunga takes the mic and says there is some unfinished business with Cena. Otunga talks about Cena laying him out after they won the belts last night. Otunga says it’s clear Cena was against him last night and Cena needs to pay for what he did. Barrett says Cena and Otunga can’t co-exist so we’re having a tag title match right now. It will be Cena and Otunga vs. Gabriel and Slater. The crowd gets quiet at the news as a referee comes out. Cena and Slater start the match off but Barrett interrupts them. Barrett says Nexus doesn’t fight among itself so someone has to do the right thing for the good of Nexus. Someone has to lay down in the middle of the ring. Barrett says that person is David Otunga. Otunga argues with Barrett. Barrett gets in Otunga’s face and orders him to lay down. Otunga continues to argue. Finally, Otunga lays down in the middle of the ring and Slater pins him for the win and the gold. – After the match, Cena storms off upset. Otunga backs in the corner and he’s also upset. Barrett, Slater and Gabriel celebrate in the ring. Barrett pats Otunga on the back and smiles. – Cole plugs tonight’s main event of John Cena vs. Randy Orton as we go back to commercial. Back from commercial and out comes Vickie Guerrero and Kaitlyn. Vickie talks about Bragging Rights and introduces her boyfriend, Intercontinental Champion Dolph Ziggler. Out next is the United States Champion Daniel Bryan. Bryan enters the ring when CM Punk’s music hits and out he comes in street clothes. Punk watches from ringside as the bell rings and they lock up. Punk joins Lawler and Cole on commentary as Dolph and Bryan go at it in the ring. Punk says he’s here to scout talent and entertain. Bryan with kicks on Dolph in the ring. Bryan applies a surfboard submission on Dolph and turns it into another submission. Bryan with right hands now. Dolph comes back with elbows. Punk says Shawn Michaels didn’t really train Bryan, he just took $3,000 from him. Punk says William Regal did the real training work with Bryan. Meanwhile, Bryan and Dolph go back and forth in the ring. Bryan causes Dolph to fall out to the floor in front of the announce table. Bryan runs the ropes and dives through them onto Dolph and the floor. We go to commercial as Bryan gets back to his feet. Back from the break and Bryan takes down Ziggler. More back and forth. Bryan misses a spin kick. Bryan goes for the LaBell Lock but can’t get it on. Bryan hits a hurricanrana from the top but Ziggler turns it into a roll-up for 2. Ziggler goes for the sleeper but Bryan counters. Ziggler with a superkick to the face for another 2 count. Ziggler goes for the Zig Zag but misses it. Bryan rolls him up but Ziggler counters with another 2 count. They trade right hands from the mat, going up to their feet. Ziggler throws Bryan over his head for another 2 count. Ziggler gets on Bryan’s back and goes for the sleeper again. Bryan fights it off hard. Bryan applies the LaBell Lock but Vickie Guerrero pulls his foot under the ropes. The referee doesn’t see this and Ziggler taps out. – After the match, Vickie throws a fit at ringside as Bryan celebrates in the ring. Vickie and Dolph argue with the referee but it does no good. Punk stands up at ringside and applauds Bryan. Bryan turns his attention to Punk. Dolph looks to attack from behind but Bryan turns around, sending Vickie and Dolph up the ramp. 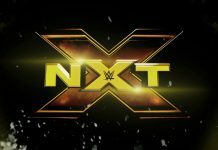 – Cole and Lawler plug tonight’s main event again as we go to commercial. – Back from commercial and we have some of the Green Bay Packers with their kids sitting in the crowd. We go to a video for the annual WrestleMania Reading Challenge. – We go backstage with Toby Keith and The Bella Twins. He gives them one of his CD’s and they give him a replica WWE Title belt. Santino Marella walks in, dressed like a cowboy. Santino breaks out in song about Divas he has had relationships with. Sheamus walks in and The Bellas leave. Sheamus calls Santino a disgrace. Sheamus says Santino embarrassed his team at Bragging Rights. Sheamus challenges Santino to a match for tonight. Santino accepts and calls it a showdown. Sheamus gets in Santino’s face and says he better show up. Sheamus walks off. Santino asks Toby if he thinks Sheamus was for real. – We go backstage with Wade Barrett. John Cena walks in and says what happened earlier tonight was bush league. Barrett says Cena is only employed because he lets him. Barrett says Cena has to do whatever he says. Cena says he loves WWE but he can’t do this anymore. Cena says whether he quits or gets fired, it’s the same thing. 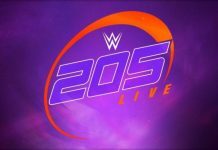 Cena looks to be quitting. Barrett stops him and says he might have a solution. If Cena beats Orton tonight, Barrett will make him an offer he can’t refuse, one that will benefit both of them. Cena walks off and we go to commercial. Back from the break and we get a replay of LayCool impersonating Bret Hart and Jim Neidhart last week on SmackDown. We go to the ring where the Divas already are waiting. Melina and Layla start the match off and go at it. Melina takes control and slams Layla’s head into the mat, getting a 2 count. Layla knocks Gail off the apron and kicks Melina in the head. Melina and Layla collide in mid-air. McCool gets the quick tag as Melina is rolling up Layla. McCool kicks Melina in the head and pins her for the win. – Michael Cole tells us that next Tuesday is an important day to vote in our country. Lawler reminds people who haven’t registered to vote that they don’t have much time left to do so. Lawler takes a shot and says be sure not to wear any WWE shirts to the polls. We see The Miz and Alex Riley headed to the ring as we go back to commercial. – Back from the break and out comes The Miz and Alex Riley. 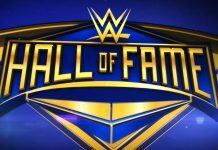 Miz says he has accomplished more in his career than anyone in the arena can dream of achieving in their entire life. Miz says no matter how superior he is, he’s not a miracle worker. Miz says he overcame hardship at Bragging Rights and lasted longer than any RAW Superstar but they still lost to SmackDown. Miz continues to put himself over. Miz says he’s the poster boy for the new SmackDown vs. RAW 2011 and shows the cover on the big screen. Miz isn’t the centerpiece star but he’s on there. Miz says if THQ really wants to make money, they should do a cover like this and shows another that has three images of himself on it. He says Team RAW should have been made up of seven Miz’s. Miz blames his team, SmackDown and Rey Mysterio for the loss. Miz challenges Rey Mysterio to come to RAW next week. Miz says people watch RAW to see him because he’s The Miz and the only person on the RAW roster that say he’s awesome. Eve Torres’ music hits and out she comes to the ring. Eve enters the ring and Miz says he knows she’s here to apologize on behalf of all the Divas. Miz rips on the way her hair looks and her taste in men. Eve says she isn’t apologizing for anything. Eve says Miz needs to worry about how everyone knows he’s nothing but a brainless, flash in the pan, uninspired, frog-faced loser. She threw in a bunch of other names before coming to frog-faced loser. Miz asks the fans if they think he’s a frog-faced loser and they do. Miz insults the Green Bay Packers and calls everyone losers as well. Eve interrupts Miz and says he’s the furthest thing from awesome we’ve seen and calls him ugly. Alex Riley interrupts and tells her to hush. Riley rips into Eve and says he doesn’t speak Gucci or anything but the Team RAW guys aren’t here tonight because they’re tip-toeing to unemployment. Riley tells Eve to go back in the locker room and see if anyone wants a piece of The Miz. Eve goes to leave the ring when R-Truth’s music hits and out he comes. Truth raps his way to the ring and asks the crowd what’s up. Truth says he wants a piece of Miz and calls him Kermit. Truth says Eve told the truth and we all know the truth hurts. Truth says he doesn’t have a problem showing Miz that the truth hurts. The e-mail alert goes off and Cole steps up to the podium. “Ding ding ding” is all Cole says and we have a match. The bell rings and Miz goes for a clothesline but misses. Truth unloads and hits a big hip toss. Truth clotheslines Miz out to the floor. Riley runs over to check on Miz as Cole stands up to cheer him on. We go to commercial. Back from commercial and Miz has Truth in a headlock. Miz continues with the offense and gets a 2 count. Miz with a knee to the back now. Truth finally fights out, slams Miz and gets a 2 count. Miz with a kick to the head and he takes it to the corner with right hands. Miz goes for the big clothesline in the corner and hits it. Miz with another 2 count. Miz takes Truth to the top turnbuckle and goes for a superplex. Truth blocks it and fights Miz off, knocking him to the mat. Truth with a boot to the head. Truth leaps to the mat but misses. Truth with big right hands. Miz comes back with a kick to the gut. Truth with two clotheslines and a spin kick. Truth drops Miz on his face for a 2 count. They go back and forth. Truth hits a jawbreaker for another 2 count. Miz ends up on the apron. Truth knocks him off face first into the announce table. Truth brings Miz back in the ring but Riley attacks from behind, sending him into the apron. Eve comes over and slaps Riley down. Truth gets back on the apron and Miz brings him in the ring. Truth runs the ropes and kicks Riley into the barrier. Truth drops Miz for another 2 count. Truth misses the scissor kick and Miz counters with the Skull Crushing Finale for the win. 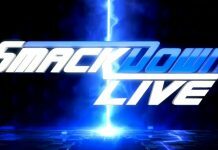 – We get more hype for tonight’s Cena vs. Orton main event as we go back to commercial and a plug for the new SmackDown DVD. – Back from commercial and Justin Roberts introduces tonight’s guest star, country music star Toby Keith. He comes out with The Bella Twins. Toby puts over Green Bay and the Packers. Toby says they’re going to do it Green Bay style tonight and introduces the next match. He says it has a lot of importance to him. Toby introduces Sheamus. Sheamus makes his way out to the ring. Toby introduces Santino Marella next and calls him his friend. Out comes Santino. The bell rings and they go at it. Sheamus dominates to start. Sheamus clotheslines Santino and starts dropping knees. Santino stands up and Sheamus goes for the big kick but Santino falls. Sheamus assaults Santino some more. John Morrison runs down and tells the referee Santino isn’t ok. Santino stands up but falls down again. Sheamus takes it to the corner as Morrison pleads with him to stop. Sheamus goes for the big kick in the corner but Santino falls, causing Sheamus to get hung up on the ropes. Santino falls on top of Sheamus and pins him for the win. – After the match, Santino and Morrison head up the ramp as Sheamus yells from the ring. Santino sells the beatdown while celebrating like only he can. We go to commercial with Sheamus still yelling. – Back from commercial and Cole leads us into a “Stand Up for WWE” video package. It starts out with various WWE stars talking about where they’re from and looking up to wrestling as kids. Cole and Lawler put over their experience with WWE and ask everyone to join them in standing up for WWE. – We go backstage with Wade Barrett, Justin Gabriel and Heath Slater with their new tag belts. David Otunga walks in and needs to speak with Wade alone. The tag champs walk off. Otunga asks Barrett why he made him do what he did earlier. Otunga says Barrett couldn’t get the job done last night so he’s trying to put the embarrassment on Otunga. Otunga says Barrett doesn’t want to go down that road. Otunga says he might tell the world why they really attacked Undertaker last night. Barrett calls in Michael McGillicutty and Husky Harris in. They’re wearing Nexus shirts and Barrett says they have officially been inducted into the group. Barrett tells Otunga he’s either Nexus or against us and he needs to make that choice right now. Husky and McGillicutty stare Otunga down and he tells them he’s Nexus. Barrett tells Otunga to keep up the excellent work and he walks off. – We see John Cena and Randy Orton headed to the ring as we go to commercial. Back from commercial and out comes John Cena for tonight’s main event. Wade Barrett is right behind him. 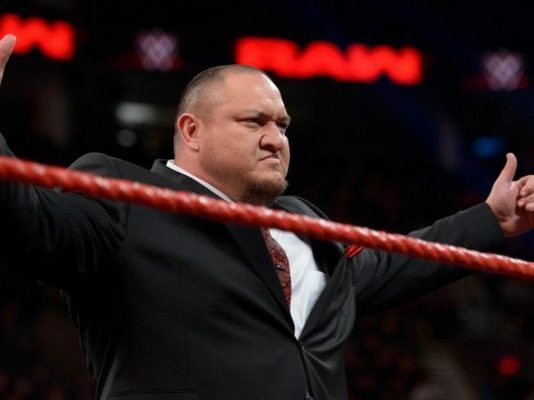 The winner of the match will get to choose the special referee for the WWE Title match at Survivor Series. Out next comes the WWE Champion Randy Orton to a big pop. The bell rings they stall some before locking up. They lock up and Cena applies a headlock. They run the ropes and Orton knocks Cena down with a shoulder. They go to lock up again but Cena grabs Orton from behind. They tangle and Cena applies another headlock. Cena with a shoulder takedown. They lock up again and go to the corner. Cena runs the ropes and tries for a bulldog. Orton takes control now with kicks and knee drops on Cena. Orton with right hands and more kicks, keeping Cena on the mat. Cena fights back with rights. Cena goes for a flying shoulder but Orton ducks and Cena flies out of the ring. Barrett comes up from behind on Orton on the floor but Orton drops him with a right hand. Cena rolls in the ring as Orton stares at Barrett on the floor. Back to commercial. Back from the break and Cena powers out of a hold by Orton. Cena goes for the Attitude Adjustment but Orton blocks it and drops him. Orton with a 2 count. Orton keeps control of the match. Orton runs into Cena’s boot int he corner. Cena hits two shoulders and the big slam on Orton. Orton hits the Five Knuckle Shuffle after taunting Barrett at ringside. Cena goes for the AA again but Orton slides out. Orton misses an RKO. Cena locks on the STF but Orton rolls out. Orton with two clotheslines and a big scoop slam. Cena ends up on the apron. Orton goes for the second rope DDT but Cena counters and backdrops him onto the floor. Barrett comes over to attack Orton but Cena runs out and shoves Barrett hard onto the floor. Barrett walks off and Orton gets thrown hard into the barrier. Cena brings Orton back in the ring and goes to the top rope. Cena hits the leg drop from up high but only gets a 2 count. Cena goes for the AA again but Orton grabs the ropes and slides out. Orton drops to the floor and brings Cena’s neck down over the ropes. Orton comes in but Cena locks on the STF. Barrett pulls the rope back so Orton can’t reach it while the referee isn’t looking. Cena sees this and breaks the hold to go outside and argue with Barrett. Cena comes in the ring and Orton catches him with a dropkick. Orton goes for the second rope DDT again and hits it this time. Orton drops to the mat and gets ready. Cena stands up and Orton goes for the RKO but Cena counters. Cena goes for the AA and hits it. Cena only gets a 2 count. Orton gets up finally and hits Cena with an RKO. Cena rolls out of the ring so Orton can’t get the pin. Cena is laid out on the floor. Orton comes out after him and picks him up, bringing him in the ring. Orton goes for a punt kick but Barrett pulls Cena out of the ring. Barrett hits Cena, causing the DQ. – After the match, Orton gets pissed and attacks Barrett at ringside. Orton pulls Barrett in the ring and continues the assault. All of Nexus rush the ring and beat Orton down. Cena recovers and starts attacking Nexus. Barrett takes the mic and orders Nexus out of the ring. Nexus, minus John Cena, stand at ringside and face Cena and Orton, who are in the ring. Barrett decides that Cena will be the special referee for the Survivor Series match. Barrett says if he doesn’t win the belt, Cena will be fired. If he does win, Cena will be free to leave Nexus. Cena hears this news and is shocked. 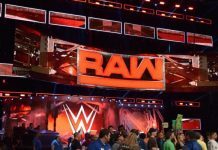 RAW goes off the air.